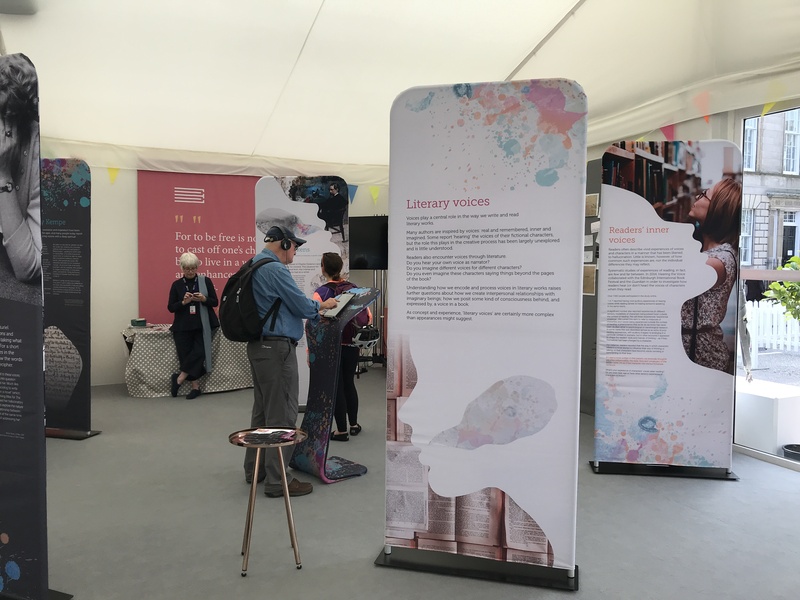 Once or twice a day, our half of the Festival Bookshop on George Street would transform from a workshop space into the ‘Literary Voices’ exhibition: a condensed (and portable) segment of the exhibition we held in Durham back in 2017. Here, we told the stories of writers who either heard voices themselves or who were intensely interested in the phenomenon (e.g. Muriel Spark, Samuel Beckett, Virginia Woolf, Charles Dickens, Margery Kempe, and so on). For those writers who did hear voices, it’s not usually the straightforward story one might imagine: the voices didn’t necessarily help the writer or tell them what to write (and in some cases they would actually be a hindrance). Instead, it’s more often the case that the writer came to think about voice differently, and developed in his or her writing a complex understanding of the ways in which voices are woven into our mental lives. The idea which prompted this came from something we’ve termed ‘Experiential Crossing’, which some readers reported to us in our online survey. In a nutshell, it’s the sense readers sometimes have of a fictional character somehow interacting with the real world: being suddenly struck by what Mrs Dalloway would think of Starbucks, perhaps, or finding yourself thinking in the style of Holden Caulfield. (Some writers reported the same experience in relation to their own characters, and a few even suggested that they actively tried to make it happen.) 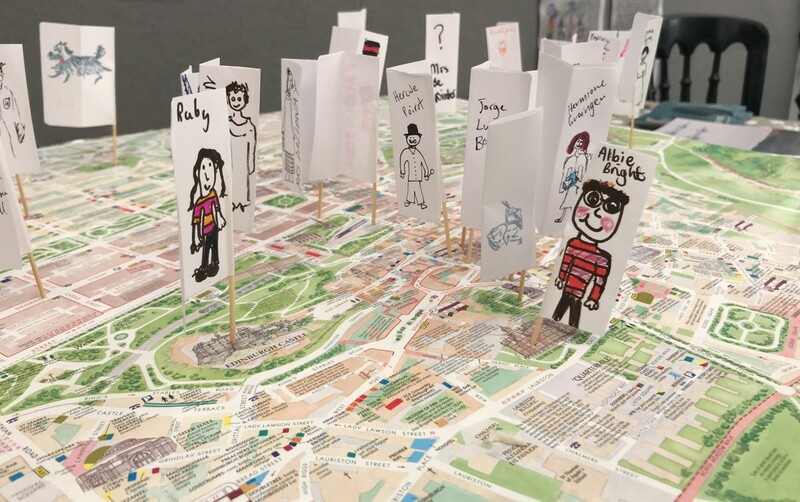 With our map, we invited visitors to draw a character and drop them somewhere in Edinburgh, as a way of both representing and trying to bring about a kind of Experiential Crossing. As David’s earlier post mentioned, the first set of workshops we ran at the book festival were all to do with creating characters and stories. But although we’re called ‘Writers’ Inner Voices’, we’re just as interested in the inner voices of readers – and that’s what our second set of workshops were all about. 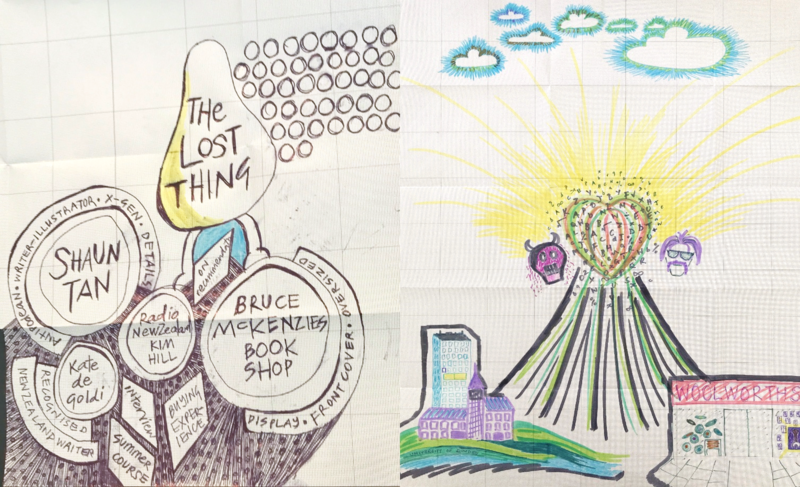 In ‘Map Your Reading Experience’, we invited people to reflect on their journeys through books that were important to them, representing those experiences visually through something that was half tree, half mind-map. Usually the mapping was fairly straightforward: the roots would be what brought you to the book, your expectations, preconceptions, predilections, personal history, etc. The trunk and/or branches would then represent the experience of the book itself: emotions, resonant ideas, moments of identification, strong imagery experiences, the point at which you got ‘hooked’… (Usually by this point we’d taken a step back, so the variations were even greater.) Finally, the leaves/blossoms/clouds/nesting birds/random circles would be the ongoing effects of the book, its influence on your life, the way it had inspired your own ideas, and so on. 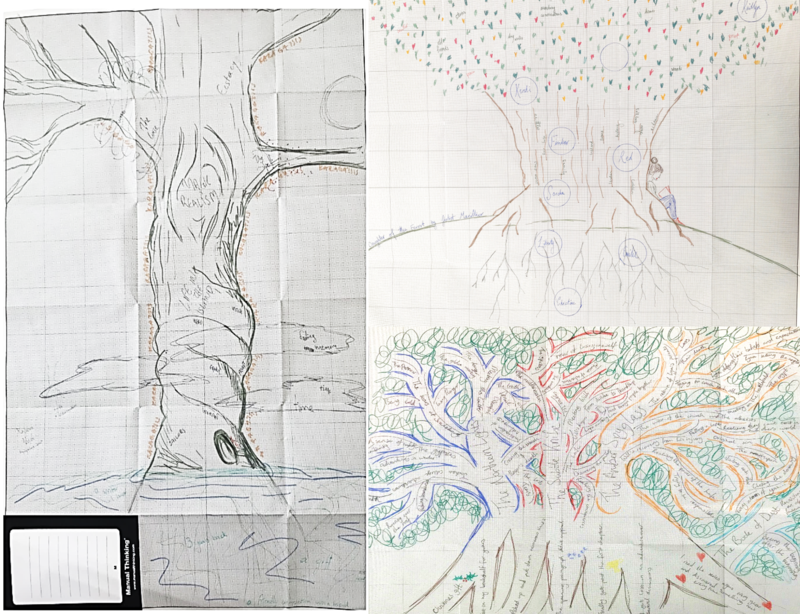 However the ‘tree’ turned out, it seemed to provide a useful tool for people to actually be able to talk about their reading experiences – something which is often surprisingly difficult. It was incredibly helpful for us as well, since it’s given us a whole range of new things to think about in relation to how readers engage with literary voices. After all, reading, like writing, is fundamentally creative, a process of turning symbols on a page into characters and worlds – and even though it’s the writer who puts those symbols on the page, it’s the reader who ultimately brings them to life.